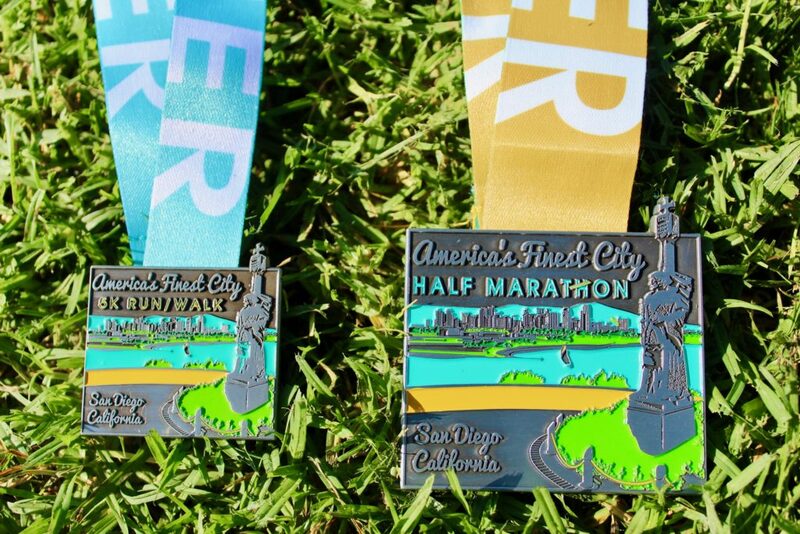 Those who commit to run through America’s Finest City are already winning purely based on the views you’ll take in and the landmarks you’ll pass by. 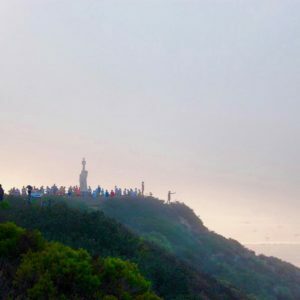 And it begins at the AFC Half Marathon start, where you’ll get to watch the sunrise atop the Cabrillo National Monument – an early morning viewpoint that few people get to see. 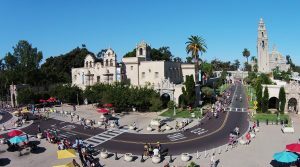 Or if the 5K is your style, the lush views you’ll pass by in beautiful Balboa Park will not disappoint! 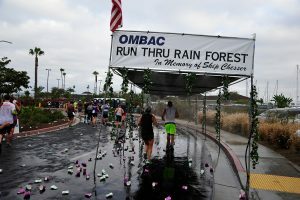 Along with the sights, other positive course distractions include water stations at every mile with Cherry Pomegranate Ultima Replenisher electrolytes offered at miles 4, 5, 8, 11, 12, cooling stations just before mile 8 and after mile 10 and awesome spectators and volunteers scattered from start to finish, cheering you along! Ultima! Get your Ultima here! Now let’s get to the good stuff… what kind of swag and keepsakes does AFC offer? 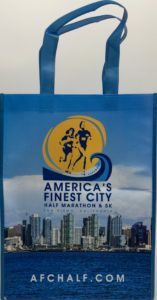 Whether you are running the half marathon or the 5K, you will receive a souvenir reusable shopping bag and a quality, technical fabric short sleeve T-shirt when you attend the AFC Fitness Expo, where you’ll also pick up your bib number with your name printed on it (for those who registered before 7/31/18). 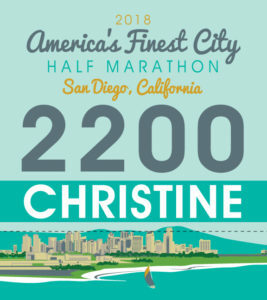 2018 AFC Half Marathon Bib Number – personalized with your name! 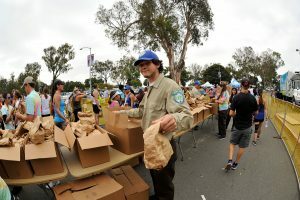 As soon as you cross the finish line, a smiling volunteer will congratulate you with your 2018 Finisher Medal and you’ll be handed an ice cold water, C20 Pure Coconut Water, Suja Juice and TruMoo Chocolate Milk (wowza!). Sidenote: if you’ve never had chocolate milk after a race before, then you are in for a TREAT! 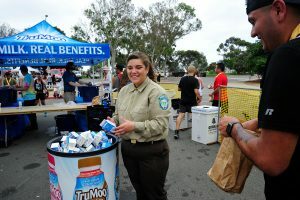 Between the carbohydrates, protein and refreshing deliciousness, chocolate milk is an excellent recovery drink and after 13.1 miles, it’s a memorable quench you’ll never forget! Warning: you may need to grow an extra set of hands to carry all your goods! Another sidenote: a recent study compared bananas to sugary sports drinks and found both comparable when it came to replacing nutrients and preventing post-workout inflammation. 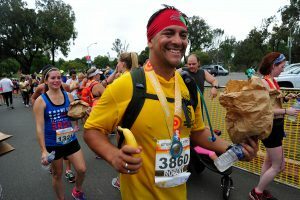 Plus, not only are bananas a great source of carbohydrates (to refuel your energy!) they also provide potassium, fiber, vitamin C, vitamin A, vitamin B6, magnesium and folate – all key nutrients for your post-race recovery. Who knew?! Now that your hands are full of recovery fuel and you are covered in 2018 AFC memorabilia, there couldn’t possibly be more – could there?! 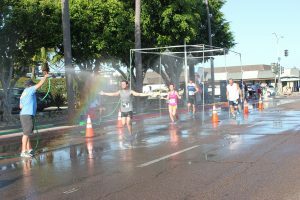 Enter the AFC finish line festival! 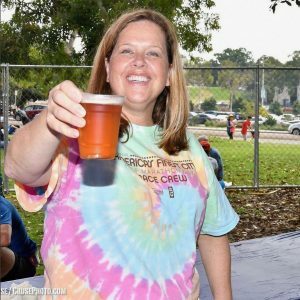 You can meet up with your biggest fans and celebrate with thousands of your closest AFC Finisher friends to the tunes of live music in the grassy festival area. You’ll also get to shop local vendors including the Official Merchandise booth where you can find a new line of quality and stylish souvenirs to wear proudly for years to come! After some shopping, be sure to take pictures in the photo booth and stop by the beer garden where those of age can enjoy a complimentary (and need we say delicious?) Ballast Point beer and snack on chips and guacamole from Rubio’s Coastal Grill. What could be more “San Diego” than that?! 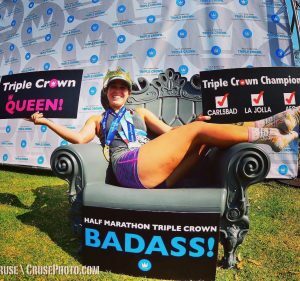 For those who will be accomplishing the 2018 Half Marathon Triple Crown challenge, you will receive your Champion’s medal at the festival and have the opportunity to celebrate a little extra in the extra large Triple Crown photo booth, complete with thrones and crowns! 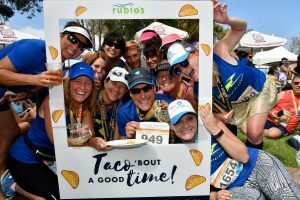 The Official Merchandise booth will also have plenty of new gear for you to shop too, and as a Triple Crown Finisher, you’ll be able to grab a Mango Shrimp Taco with mango salsa and handmade guacamole from Rubio’s Coastal Grill. YUM! 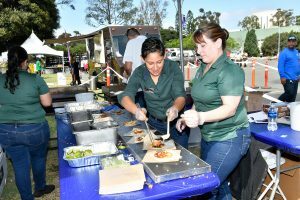 Mango shrimp tacos exclusively for Triple Crown Finishers! 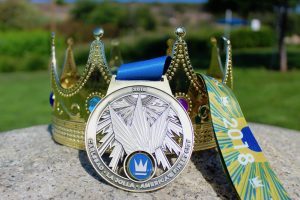 Last but not least, since our event is a race after all, there will be age group awards offered to the first three finishers, male and female, in both the half marathon & 5K in the following age groups: 17 & under, 18-24, 25-29, 30-34, 35-39, 40-44, 45-49, 50-54, 55-59, 60-64, 65-69, 70-74, 75-79 and 80+. 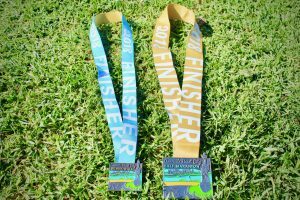 The top three overall male and female half marathon finishers will also receive a special award, which will be presented on the main stage. 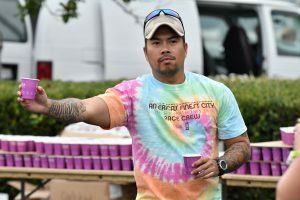 If we didn’t have you at hello, we hope by now you are excitedly signing up because our events are not just races where you show up to sweat and run – they are an experience, and often a life changing and particularly memorable one at that. We can’t wait to see you on Sunday, August 19! Happy training, see you soon!